The ladies of DPS knew how to live large near the tail end of The Great Depression. And boy howdy, could they tilt a hat just so! 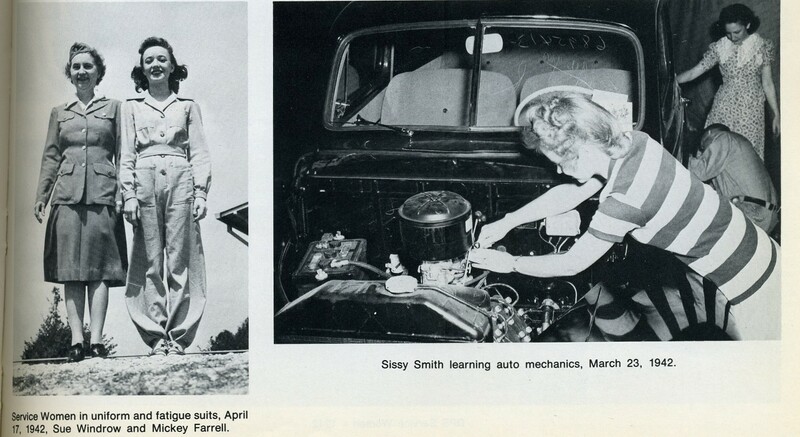 As the war got into full swing, women assumed roles formerly filled by men, and literally got their hands dirty. 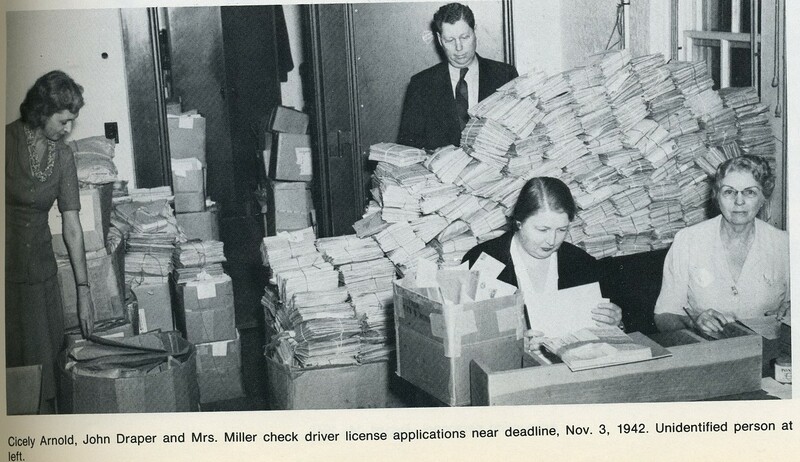 But women with administrative duties were not left idle; check out the STACKS of driver license applications behind Cicely and Mrs. Miller. After the war ended, applications continued to pour in. 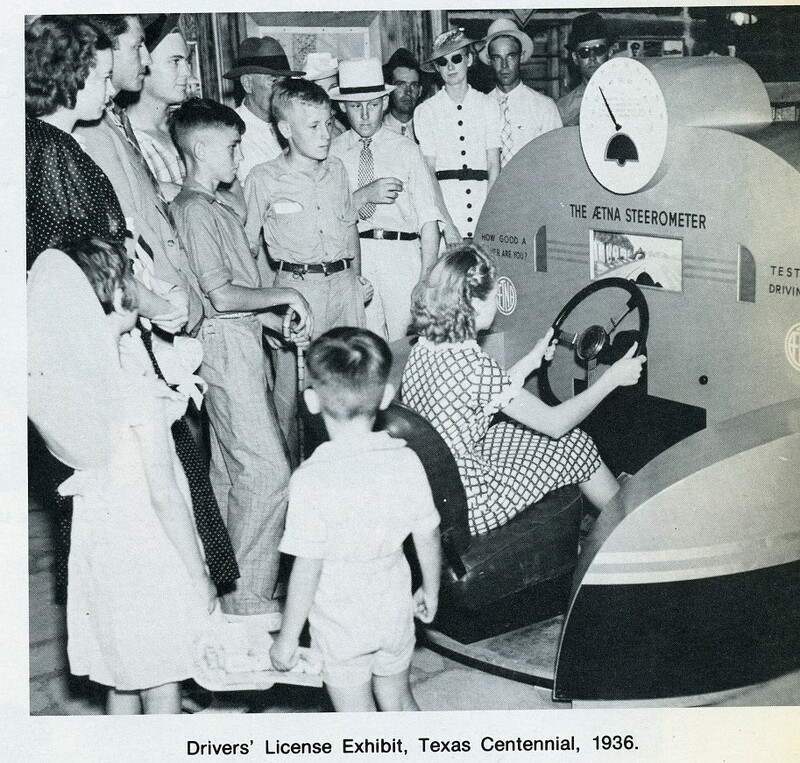 Meanwhile, lucky teens were trying their hands at the new Aetna Steerometer, which simulated driving conditions. 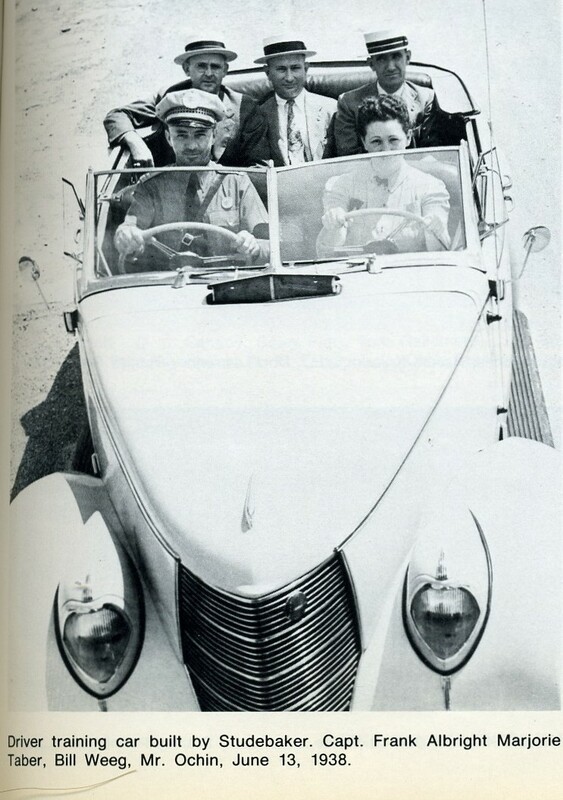 Student drivers got to take a spin in the snazzy Studebaker training car. Hold on to your boater straw hats, gents! Maybe they’re going to pick up the fourth member of their barbershop quartet? 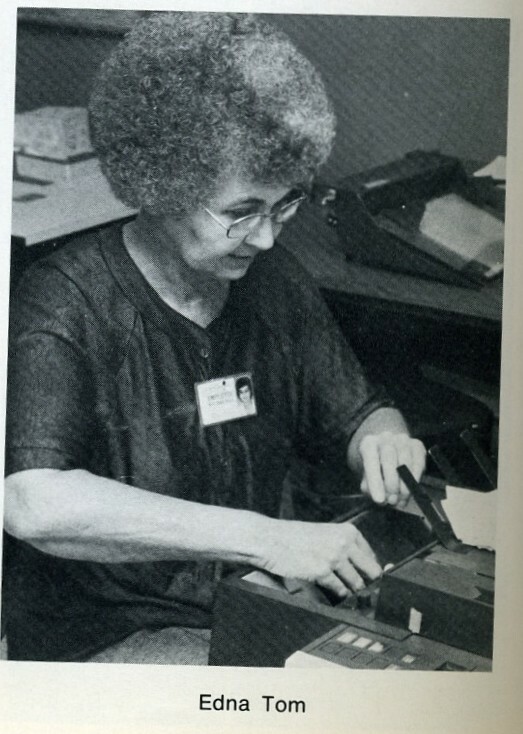 As the years rolled by, DPS workers changed with the times, as seen by the lovely hairdos of Ms. Davis and Ms. Deeds, bookending a stern bespectacled Gene Kelly. But secretary Tom was not about to be upstaged. She knew how to stay abreast of current trends. 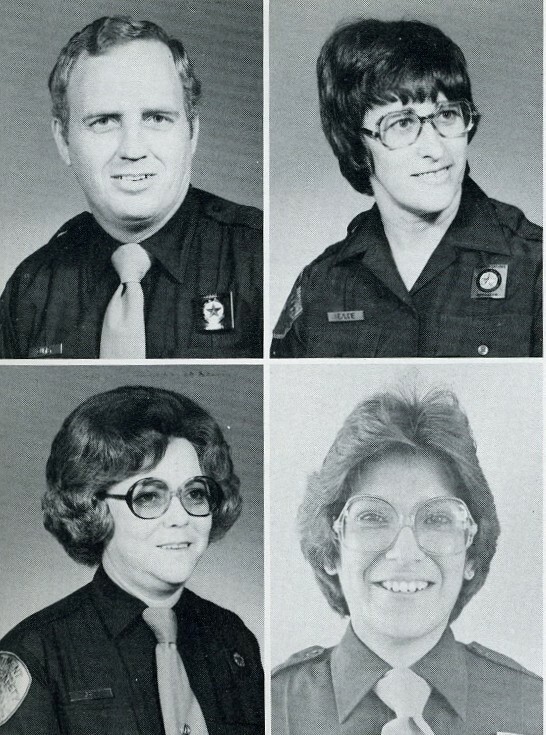 Some women were forced to wear uniforms, so they had to assert their individuality with enormous glasses. Three of these people are actually women. But let’s go out on a high note, with the cheery Loveboat-cruise director smile of Ms. Stade and the blonde wings of love about to give Ms. Steele lift-off into space. And with that, we close the chapter on DPS. Remember that it’s the end of May, if you’re inspection sticker is almost due. You wouldn’t want to get ticketed. Next Almost Cute Enough To Make Me Vegan. Almost. Another of your fun to read pieces. I remember trying one of those driving assimilators – it was fun. Did it have animated trees and buildings go by? It was like a film of driving down the street, but you still had to keep that car on the road. 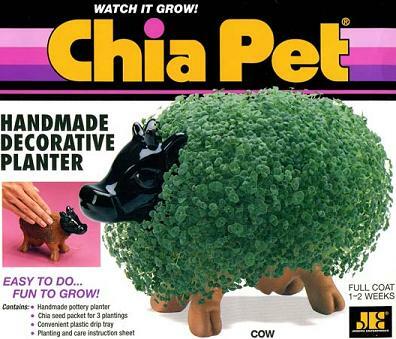 So that’s where Shaun Cassidy got the inspiration for his do… Ms Stade. It IS a similar shape, now that you mention it. It seems to me that Russell Deaton and Grumpy cat are related. I googled Grumpy Cat, and he looks dead behind the eyes. Like maybe he’s working the tail end of his 9th life and is so over it. See what patrolling can do to a person? He should have been singing in the rain!